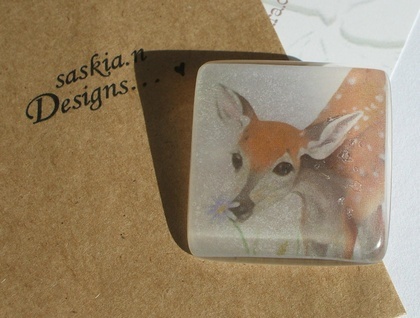 "Resin Brooch with image of a Little Fawn from my own painting (2010). Brooch is handmade and casted with resin, sanded and polished for a smooth shiny finish. Every piece is slightly different and has been made with care, joy and attention. Brooch comes packaged with acid free tissue paper, handmade paper and presented in a wee brown envelope.